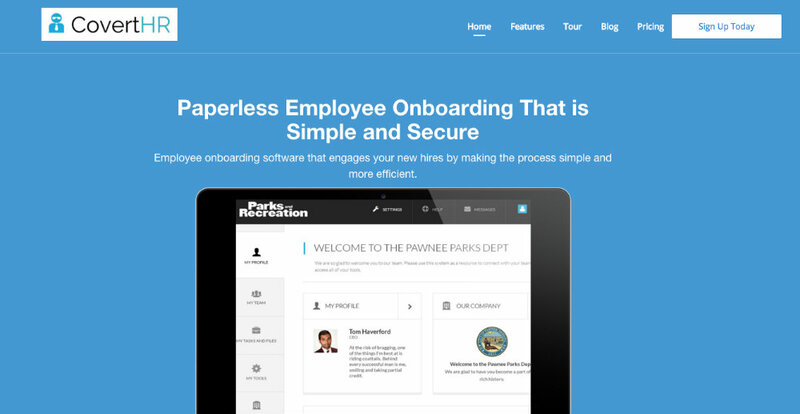 Let me repeat that: PAPERLESS employee onboarding. Dream come true, right? I recently accepted an engagement with a public school system that entailed so much paperwork that it reduced me to tears, no joke. Not only did I have to fill out an unbelievable amount of forms, I had to make special trips to special buildings – nowhere near where I’m actually working – just to get a foot in the door. It just… why do we still have so much paperwork with all the Internet tools at our disposal? CovertHR asks the same question. However, rather than merely gripe as I am prone to do, they’ve created an employee onboarding platform that’s entirely paperless. OK, you’ve still got to fill out forms, but you can do so digitally. What’s more, they gamify the process to make it more enjoyable – and to prevent crushing the enthusiasm of new hires for beginning a new job. Simple electronic signatures. Documents, both tax and custom forms, ready to be filled out. Information and tasks clearly laid out… I would have been thrilled with this improvement to the process, at any job that I’ve had in my lifetime. Throw in a scavenger hunt or bingo game to break up the arduous journey? Now we’re talking. We’re talking major time savings, for both new employees eager to get to work and in staff hours required to process new hires. I’m sympathetic, I truly am. Depending on the position and industry, it’s important to have formal agreements and paperwork in order. But, I think we could all do without the actual paper, not to mention the dull and endless task of completing forms. Make it all go away, CovertHR. Discouraging a new employee with gobs of paperwork is a horrible way to start a work relationship. Make the process fun, and not only will you treat that employee to one of the most unexpected, delightful surprises of his/her life, but you will certainly spur your latest recruit to talk up your company with great appreciation. Find out more about how you can revamp your onboarding program with paperless ease, at coverthr.com.